First it was Whipping Girl complaining that we hadn't eaten together for awhile, now it was Miss Y's turn. Gawd, guess I shouldn't be complaining eh? Attractive women wanting to go eat with me? Why didn't I have this problem in High School??? Oh right... The glasses and appearing "too smart" probably didn't help (see the emphasis on appearing). Seeing how I was one day removed from my birthday, Miss Y offered to take me out for eats. As per usual, she left it up to me as to our eating destination. It may seem like a simple task, but finding an interesting place to dine is sometimes tricky. After a bit of thought, which really hurt my head (where are those glasses? 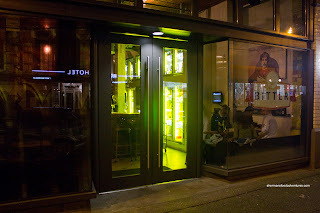 ), I remembered the newest addition of Sean Heather's "restaurants in weird locations". Bitter Tasting Room is located right smack dab in the Downtown Eastside. Roughly across the street from Army and Navy, it appears the redevelopment of the area is beginning to creep Eastward from Woodward's. I was so not expecting the restaurant to be located on Hastings at Carrall. So much so, I drove right past it. Once we got in the place, the layout actually made it look spacious. They could probably cram a few more tables in there if they wanted to. We chose a corner seat and went about deciding what to order. Of course beverages were a must, especially with the great beer selection. 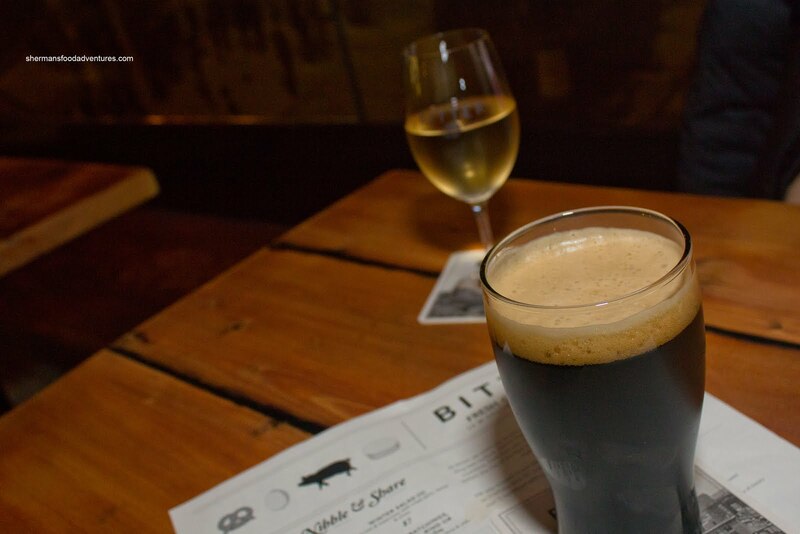 I had their Milk Stout and Miss Y opted for a white wine. We shared a couple of small bites starting with the Pork Scratchings, Cracklings, Rind or Chicharron. Yes, that is what they called it on the menu. I guess they wanted to cover all the possible names. 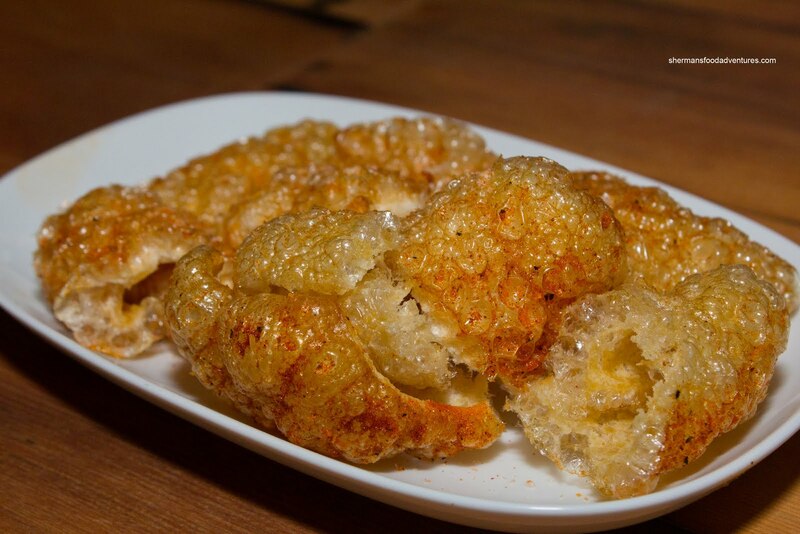 Well, one thing we do know, it is essentially fried pork rinds. We only found these to be okay. They sure were crunchy, but a touch hard. I've had many versions of fried pork rinds and these were not as light and airy as it could've been. It could be attributed to personal tastes though. We did like the "just enough" amount of seasoning which consisted of salt, pepper, citrus and chili. Our second little bite was a Scotch Egg consisting of a free-range Rabbit River Farm egg wrapped in garlic sausage coated with breadcrumbs and fried. It was served on a bed of grainy mustard and topped with parsley. This was pretty good with a perfectly hard-boiled egg (notice there was no dark ring) and a tasty layer of sausage. The sausage was a bit chewy while still moist. The crunchy crumb coating was a nice textural contrast and wasn't greasy. This was probably the best thing we had in terms of food. We ended up ordering 1 of the available 3 larger dishes since the menu wasn't exactly full of choices. 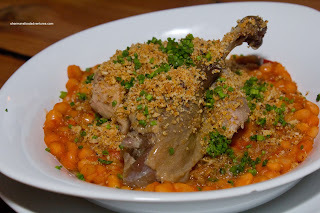 The most intriguing of the mains was the Cassoulet with duck confit, pork belly, Toulouse sausage and braised beans. The protein components of the cassoulet were done quite well with the duck confit being moist and tender (a bit salty though). The pork belly was also moist and surprisingly lean while the Toulouse sausage was fatty and meaty. However, the beans weren't as successful. There was nothing particularly wrong with them texturally, but the tomato sauce was not really all that memorable in flavour. It lacked any defining taste and in fact, was not balanced. 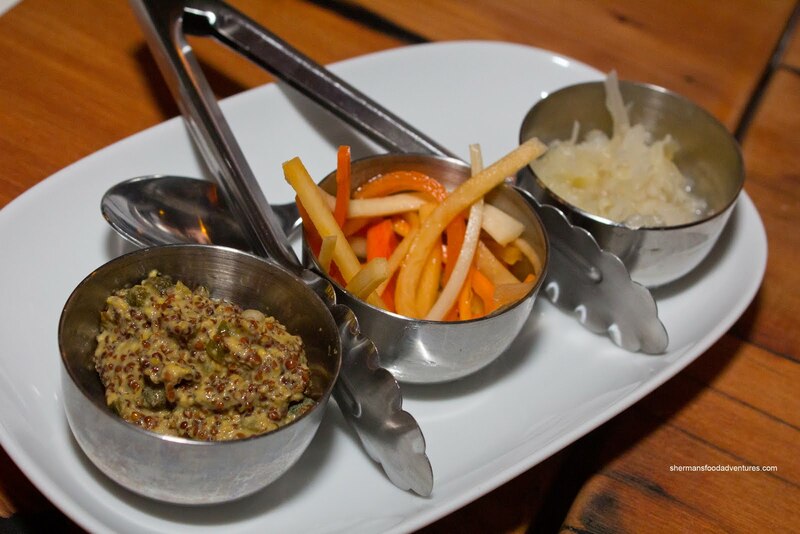 For our second bigger item, we had the Krainer Sausage accompanied by 3 condiments including a mustard ragu, pickled veggies and sauerkraut. We originally tried to order the Weisswurst, but they were out of it. The Krainer was their special of the day, so it is not on the regular menu. This dish was meant to be shared and well honestly, Miss Y and I could not finish it. 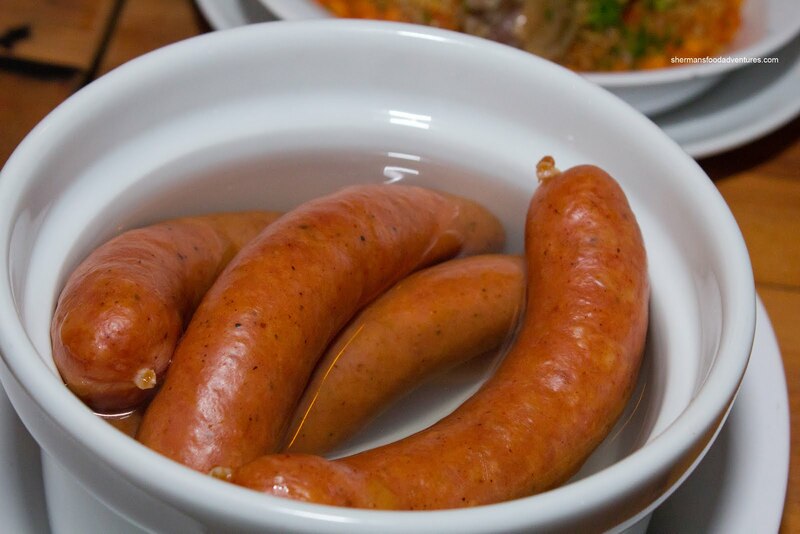 Maybe we need to bring a few friends to help us with the sausagefest. Miss Y ended up taking a sausage home with her... er... The sausages themselves had a nice snap casing while the meat inside had a good bounce and was really juicy (well, a good amount of fat helped that). I thought all of the condiments went well with the sausages due to the abundance of acidity which helped cut through the richness of the meat. After all this, we were pretty stuffed with meat but Miss Y pulled a Mijune and decided to go with dessert anyways. 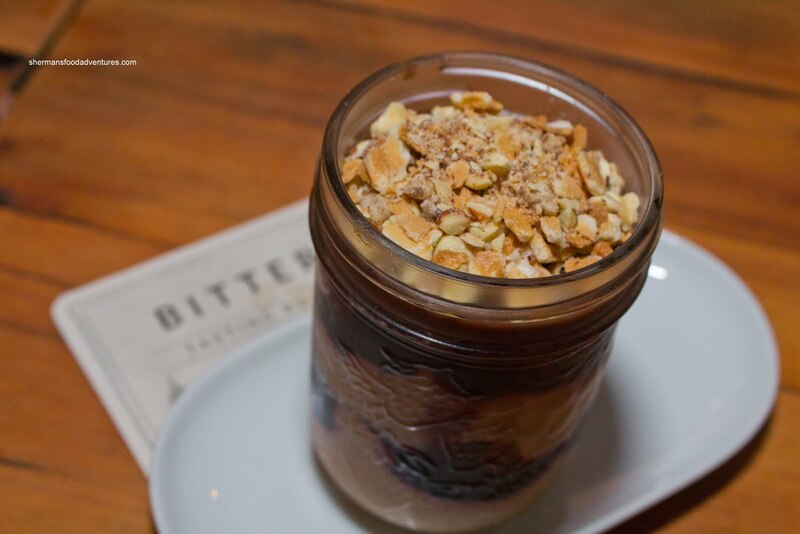 From the 2 available on the menu, we had the "Chocolate" as described on the menu: layers of chocolate cream mousse, carmelised hazelnuts, chocolate ganache, waffle cone bits laced with dried cherries. Not the most refined dessert, yet still enjoyable to eat, it had it all - crunchy, nutty, tart, sweet, chocolatey and chewy. They covered all the bases and it was balanced. Although our visit to Bitter was hardly outstanding, it was a whole lot better than we thought it would be. Consider it a great place to grab a drink with a few bites on the menu to accompany it. 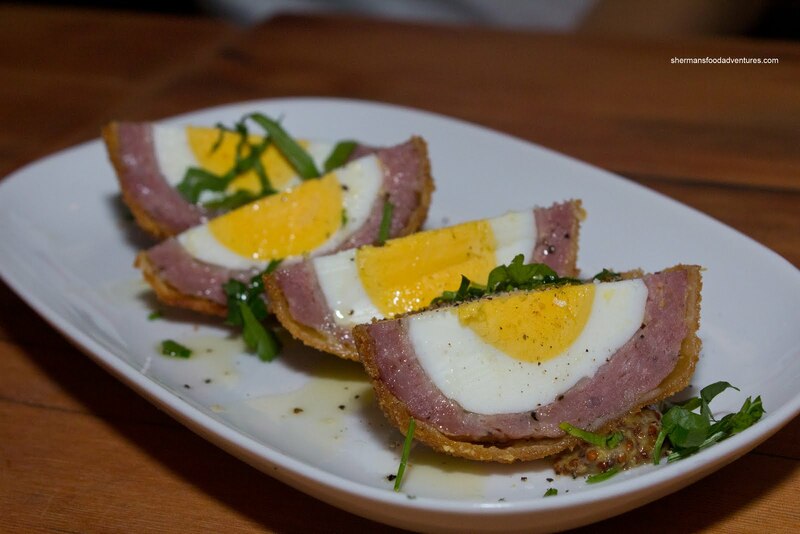 Wtf.. my scotch eggs were not plated the same as yours. Yea, the focus is on the beer and the snacks, maybe the sausages...definitely not the main dishes imo. Next time I go, def trying out the pork rilette. Actually, how about you and I go together sometime? It's been a while Sherman! That pork runs reminds me of snacks from Thailand with shredded pork or the fried fish skin we order at hot pot places. But overall I wonder if I tasted excessively greasy or would it be utterly addictive? I bet I would get into a lot of trouble after a few beers. Mmmmmm beer!! oh and same thoughts about the chicharron..they were so dry and crunchy.. not fluffy and airy. doesn't help that I saw the staff come out from the back with a container full of them already fried. @Kevin I went last Thursday. Maybe the fact I was with the gorgeous Miss Y might've been the difference? Yes, drinks first and if you're drunk, the food will be good. LOL... Sure, we need to meet up! I suspected that the pork rinds were pre-made. Way too hard. @nance It wasn't greasy, but I've had way better.